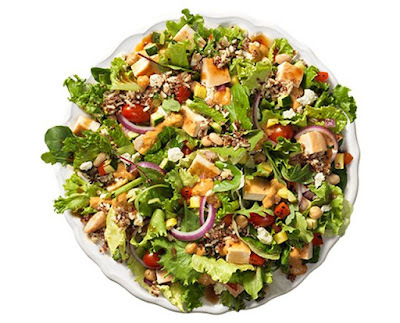 Catering towards consumer demand for more protein, Wendy's is testing the Power Mediterranean Salad with 39 grams of protein per salad. The salad features feta cheese, hummus, and sundried tomato quinoa blend, which are not currently on the Wendy's national menu. The sundried tomato quinoa blend includes a mix of red bell peppers, green zucchini, yellow squash, garbanzo beans, great northern beans, brown rice, red quinoa, white quinoa, and sundried tomato. Also in the salad are grilled chicken, iceberg lettuce, spring mix, tomatoes, and onions. The dressing for the salad is a light balsamic vinaigrette. The Power Mediterranean Salad can currently be found in Columbus, OH, Greensboro, NC, and Wichita, KS. Quinoa tends to be more of a fast casual (like Panera Bread) ingredient that hasn't quite made it onto the fast food scene, at least not among the major chains like Wendy's and McDonald's, so it'll be interesting to see where this goes.